When Australian Jane Paech moves to Paris, her visions of afternoons in bijou bistros and bookshops on the Left Bank are kept in check by the needs of a young family and a long to-do list that includes apartment-hunting, school selection, and multiple trips to IKEA. 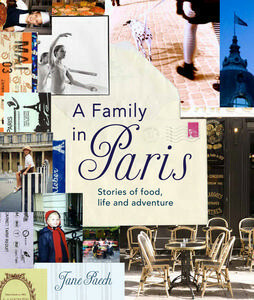 Through a collection of sharp observations, insightful travel articles and laugh-out-loud anecdotes, A Family in Paris conveys the joys and difficulties of living in this most famous of cities. It introduces us to the Parisians and their eccentricities, explores the intricate rituals of daily life, and takes us beyond the well-trodden tourist sites to the best eating spots, boutiques, museums and markets that only a local could know about. Frank, intimate and beautifully photographed, A Family in Paris is about making a home in a strange land, finding a community, and discovering the joy of renewal. Annie was given this truly wonderful book as a birthday gift and since then there have been debates here as to whose turn it is to read it. I find it fascinating, enchanting, entertaining, a simply a delicious book, full of terrific photographs and of course being published by Penguin Australia under their illustrious Lantern imprint the book is a gorgeous piece of design. Jane Paech grew up on a farm in South Australia where her lifelong love of food was born. Living in New York further ignited her passion for both food and travel, and when the opportunity to live in Paris arose, she turned from a career in nursing to travel writing. Her work has been featured in many publications including Australian Gourmet Traveller and the Sydney Morning Herald. Are publishers ignoring the goldrush? Bill Manhire - rock star ! ?